Description: The Acclamator-class assault ship, alternatively referred to as the Acclamator-class trans-galactic military transport ship or Acclamator-class transgalactic military assault ship, or by the shorter names Acclamator-class transport, Acclamator-class troopship, or the rarer Acclamator I transport, was an assault-class capital ship created for the Galactic Republic by Rothana Heavy Engineering. It was the predecessor of the Star Destroyer line. The Acclamator-class assault transport was 752 meters long, 460 meters in width, and 200 meters in height. 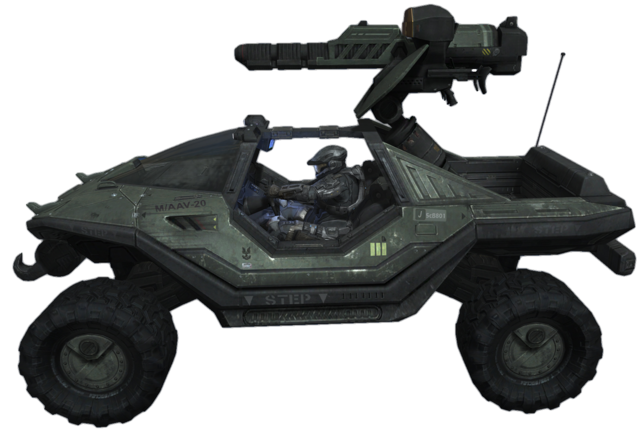 Its mission profile required it to both carry troops and engage enemy starships: the Acclamator was designed to assault contested systems, break hostile orbital blockades, and land troops directly on the battlefield. 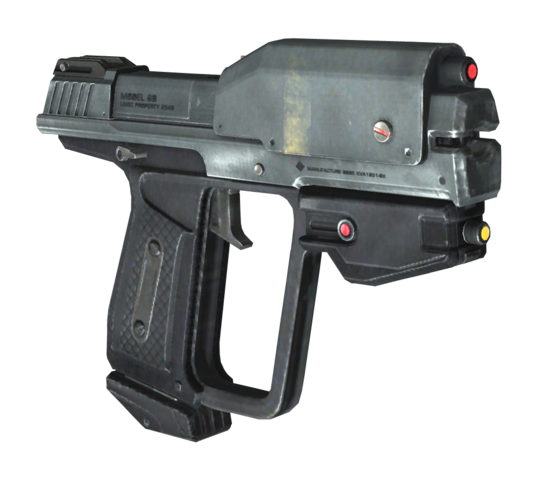 Consequently, the Acclamator favored a wedge or dagger shaped design due to its effectiveness�it allowed concentration of firepower while minimizing target profile. This basic design was used in a number of larger craft pre-dating it and would define Imperial ships for decades to come. The underside of the Acclamator was dominated by a large assault hangar capable of offloading an entire legion of clone troopers and their vehicles in short order. Most of the passenger and barrack decks were located on the upper levels of an Acclamator-class ship. The bridge was located in the middle of an arrow-shaped command tower module that protruded from the dorsal superstructure. This tower module was a standard design for smaller ships in Kuat Drive Yards's starship catalog, which Rothana supplied vessels to. The main bridge and command center had no windows but relied upon advanced holoscreens shaped like the triangular viewports similar to the ones on other Kuat vessels. The bridge crew usually consisted of fully-armored clone pilots manning the control panels, with most operators being seated in twin crew pits below the command officer's area. Sensor and communications suites were located at the front of the ship's command tower. Acclamator-class ships had berths for sixteen thousand clone troopers, the equivalent of an entire legion or brigade and its support personnel. They also carried eighty aircraft and eighty-four armored vehicles, such as the AT-TE and SPHA walkers, used to provide clone troopers with heavy battlefield support. In addition to ground landings, Acclamator-class ships were capable of water landings, as displayed at the Battle of Mon Calamari. Each Acclamator-class ship held 320 speeder bikes, used by clone troopers for fast battlefield reconnaissance and patrol duties. Eighty Low Altitude Assault Transports, of which around 66 were infantry gunships and around 14 were vehicle carriers, were carried to insert personnel, vehicles, and cargo into battle zones in addition to providing close air support. Gunships were suspended along an overhead circulating rail in the upper hangar for maintenance procedures during travels. A lower, smaller hangar area was used to embark and disembark ground troops and material via a large ramp when landed. The two levels were connected with elevator platforms. Despite being largely transports for land forces, these ships were armed well enough to engage in planetary bombardment or ship to ship engagements. Armed with 4 heavy torpedo launch tubes; 24 point-defense cannons, rated at 6 megatons per shot; and 12 quad turbolaser turrets, each rated at a maximum of 200 gigatons per shot. The hull armor of Acclamator-class vessels was impregnated with ultra-dispersive neutronium that withstood and spread massive energy blasts. Fusion rockets fired by enemy forces barely made a scratch on the hull as a result. Groups of these ships could perform a "Base Delta Zero", an orbital bombardment that would exterminate all life on the planet. The later Acclamator II-class could also serve as star frigates to support their landing groups. The Acclamator-class's main reactor was located in the middle of the vessel, inside the main superstructure, and was preceded at the frontal half of the ship by multiple fuel tanks. The tanks compressed hypermatter to enormous density for storage. The tanks were connected to the main reactor via pipe assemblies. Secondary reactors were located towards the bow of the vessel. The ship's main thrusters were fitted with eight electromagnetic rudders that deflected the exhaust particle streams and gave boost when turning the ship. The secondary thrusters did not provide as much power, but were useful for maneuvering due to being placed further away from the ship's main axis. The massive fin at the stern of the Acclamator-class contained both the anti-gravity generator and the ship's hyperdrive generator. When landed, the repulsorlift carried much of the ship's weight, but the landing legs maintained a stable contact with the ground. The massive hyperdrive generator took up some two hundred meters of the ship's length, and allowed a sustained hyperspace cruising speed of Class 0.6. 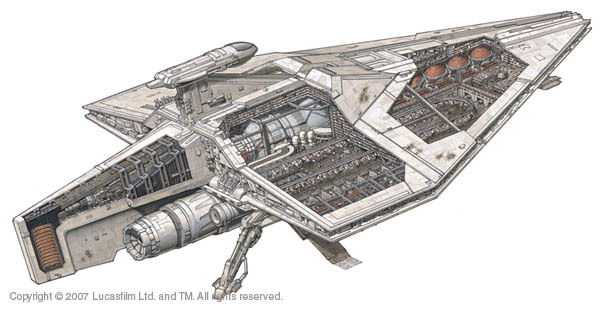 The Acclamator-class design was already in development by Rothana and Kuat years before the start of the Clone Wars, and the design was tested as early as 32 BBY. As the Jedi Master Yoda arrived on Kamino to gather an invasion force, dozens of Acclamator's had already been built and readied for the soldiers they were designed to carry. In their first engagement at the First Battle of Geonosis, the class proved pivotal in the Republic victory, delivering legions of clone troopers to the battlefield while a large Republic fleet engaged the Separatist fleet in orbit. After delivering their troops, the Acclamators pulled back to provide orbital support, with only a portion of the ships ending up damaged in the battle. Just after the battle had concluded, the Republic ordered 1,000 more Acclamators based on their success as primary ground force delivery vehicles. All Acclamators were completely crewed by clones, though they would also count regular Republic officers among their crews, as the war ground on. Apart from this, the Acclamators and larger warships were generally off-limits to most regular defense force personnel. During the height of the war, some Acclamators had the paint markings of the Open Circle Fleet like the Venators. Several different variations were used during the war, with the Acclamator II-class assault ship being the most numerous alternate model. 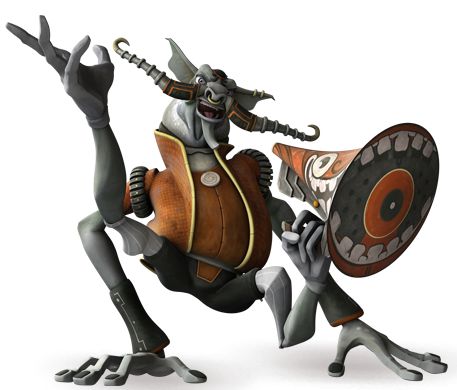 The subclasses saw many battles in both the Clone Wars and the Galactic Civil War. Many were operated to act as mobile depot ships or dedicated clone commando carriers. For the Battle of Muunilinst, the assault ship Nevoota Bee was modified as a carrier, with her hangar decks dedicated to holding 156 V-19 Torrent starfighters. The Victory-class and other Star Destroyers were based on the Acclamator. In addition to being a warship and a military transport serving forces in backwater areas, some Imperial Acclamators were used as slave ships, transporting large quantities of enslaved people to various Imperial penal colonies during the Galactic Civil War. Although they were initially not considered "Star Destroyers", the Acclamator-class was sometimes referred to as such during the reign of the Empire. The Empire also modified a number of Acclamators, sacrificing weaponry to increase cargo capacity for use as Imperial cargo ships. 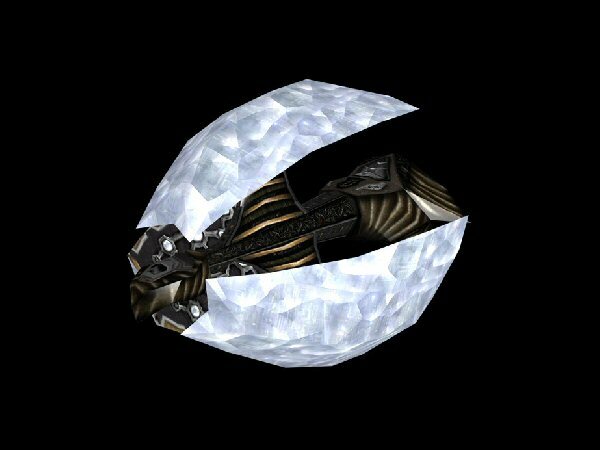 The Empire never used the Acclamator in its fleets but did use them in planetary defense or skirmishes. Some fell into the hands of criminal groups such as the Zann Consortium. The Empire continued to use them as of Operation Shadow Hand, and by 13 ABY, an Acclamator was located in the headquarters base of the Restored Empire splinter faction of the Empire. They were even used well into the Yuuzhan Vong War.